Unmanned Aerial Vehicle or UAV market growth is buoyed by security concerns, predominantly, terrorist threats, border intrusion, and rise in domestic crime rate; India recorded over crime 3 million incidences in 2016, growing from 2.2 million incidences in 2015. India is amongst top countries in terms of UAV imports; India accounts for about 20% of the global UAV imports. Moreover, the Government of India's “Make in India” initiative is likely to push domestic manufacturing of these drones which would drive India UAV market forecast revenues over the coming years. According to 6Wresearch, India UAV market size is projected to grow at a CAGR of 18% during 2017-23. UAV market in India is presently growing at a significant rate; wherein, in terms of volume, mini-UAV segment acquired majority of India UAV market share, followed by, medium, and long range UAVs. Long Range UAVs (High Altitude-Long Endurance) segment is in developing stage which is likely to enter in the India market by 2021. Due to high cost concern, India is targeting more towards domestic manufacturing under “Make in India” initiative. Rustom-H is most likely to be the first long range UAV in the country. Rustom-H is expected to enter in the market by earliest 2021. In terms of end user applications, military application market held major share in the overall market. Moreover, over the coming years, with upcoming clarification on DGCA regulation for commercial usage, the market is likely to register higher adoption in India. Some of the key players in India UAV market include- Hindustan Aeronautics, Israel Aerospace Industries, Bharat Electronics, TATA Advanced Systems, Dynamatic Technologies, Larsen & Toubro, and Ideaforge. The India UAV market report thoroughly covers unmanned aerial vehicles market by Types, Range, and Applications. 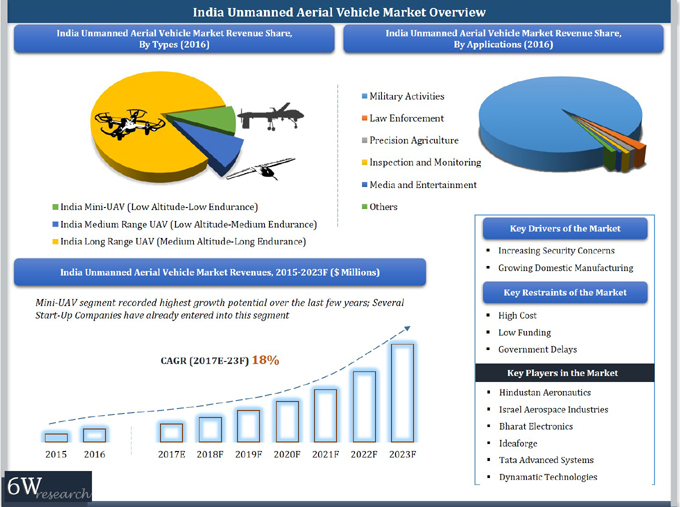 The India UAV market outlook report provides an unbiased and detailed analysis of on-going India UAV market trends, opportunities high growth areas, market drivers, which would help the stakeholders to device and align their market strategies according to the current and future market dynamics. • India UAV Market Size and India UAV Market Forecast of Revenues until 2023.